In the Sacred Triduum, the Church solemnly celebrates the greatest mysteries of our redemption, keeping by means of special celebrations the memorial of her Lord, crucified, buried and risen. At Ealing Abbey to mark this we will be hosting a Monastic Experience Weekend. The weekend offers young men a chance to meet the monastic community, to learn more about the life and ministry of a monk and to join with them in the celebration of the Divine Office and Mass. 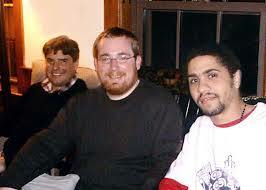 In monastic life we learn new practical, professional and interpersonal skills in order that we may live to the full. Monastic experiences for Catholic men (18-45) are ways that the monks of Ealing Abbey respond to the current interest in forms of life consecrated to God. Over a 48-hour period or longer men have the opportunity to spend time with other enquirers who are also seeking to know God’s will in their lives, to have some quiet time away from their everyday activities, to pray and to have a taste, at least, of Benedictine life. The feedback that we have received is that these weekends are a worthwhile exercise in helping our visitors to clarify their thinking about many important decisions in their lives, not least with regard to a possible vocation to the religious or monastic life, or to the priesthood. The format of the Holy Week is as nearly as it can be to ‘the monastic experience of Holy Week’. 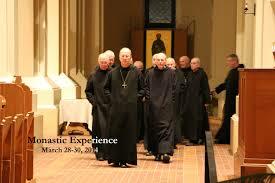 The monks simply invite men to come and experience the richness and tradition of a Benedictine Holy Week. If they do, they will have the chance to share in the community’s liturgy at Mass and in the Divine Office, and to spend some time in private prayer and private reading. They are invited to have a taste of the community’s life and, if they wish, to speak about their own lives. The format of the weekends is as nearly as it can be to ‘the monastic round’ and is based on what monks have always done for men who think that God may be calling them: simply invite them to come and see. If they do, they will have the chance to share in the community’s liturgy at Mass and in the Divine Office, and to spend some time in private prayer. There are usually a few short talks and an opportunity for reading. They are invited to have a taste of the community’s life and, if they wish, to speak about their own lives.